This major WeDpro project for 2015 was made possible thanks to funding from the American Jewish World Service (AJWS). 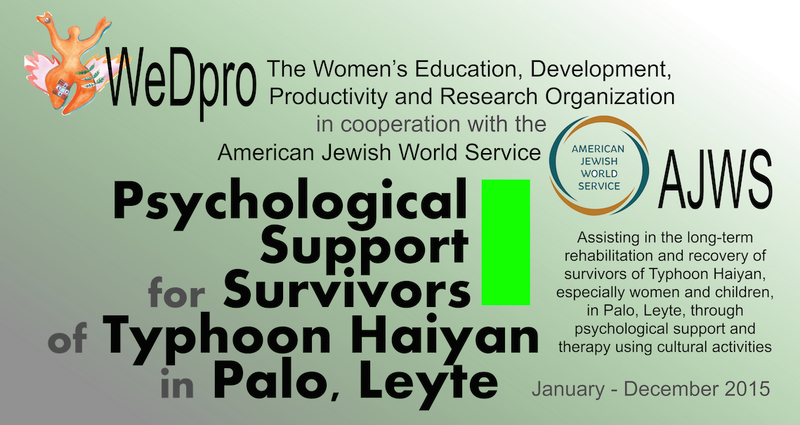 The project goal is to help the long-term rehabilitation and recovery of survivors of Typhoon Haiyan – especially women and children – in Palo, Leyte through cultural activities that provide psychological support and therapy. This project includes various activities, workshops, and events throughout 2015, such as a cooking workshop, radio programming, and youth performances. As they roll out, we’ll give you updates about them here and on Facebook. On that note, WeDpro has just held the cooking workshop, called “Food, Art, Healing” – which brought women and youth together to share knowledge and cook traditional/local food as a form of psychosocial healing. Look for more information and photos from this workshop in the next post!